If you would love to harness the power of email marketing for your speaking business, but don’t feel you have the time, there is hope! 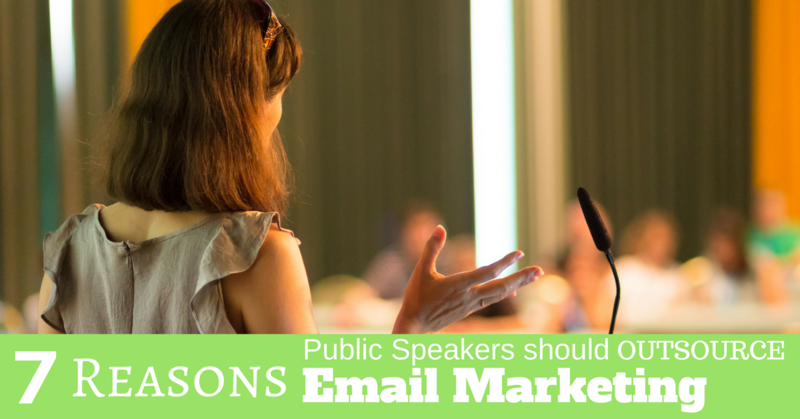 …and you hear that other public speakers are crushing it with email marketing, but you haven’t gotten quite around to it for your speaking business. Here are reasons that public speakers are not using email marketing to feed a continual stream of new sales month after month. 1) You aren’t really certain how to get anyone to buy anything from you by email. If you’ve never done anything more than the occasional newsletter, you may not have even turned your first dollar from email marketing. Or if you get a few sales here and there, you are not certain how to do it again. This can be maddeningly frustrating, and this is where most public speakers quit. This is far more common than you may realize. I’ve worked with speakers who have been on the speaking trail for over 10 years yet barely have an email list of 50 people. The good news is that this can be fixed quite easily, especially for those of you who are more senior in your speaking career. You have a choice. You can either be on stage growing your brand, or you can be stuck in your office typing emails. Being on stage wins every time! To the uninitiated, the technical aspects of email marketing can be a little daunting. Lists and sub-lists and html code and sequences and tagging…it can get a little overwhelming, especially if you are not using it every day. If your brain is not naturally wired for marketing (few are), you might feel you don’t have any good ideas, or that people simply won’t want to buy what you have the offer. It Works – Working with someone who stays up-to-date with what is working in email marketing right now. You don’t get yesterday’s leftovers. Freedom from Tech Hassles – Someone who is technically literate and knows how to help you get the most out of your email marketing system (without your banging your head on the table in frustration). Make the Sale – Someone who understands copywriting and sales psychology can close the deal rather than let it get away. Speed to Market – Someone who can knit all the pieces together faster than you could by yourself. Focus – Delegating email marketing to a competent individual gives you the freedom to focus on what you do best. List Building – A good marketer can help you develop a very responsive list over time. Automatic Pilot – Once you figure out how to do this once, you can automate it! Schedule a time to get started by clicking here. We get together for our initial 30-minute phone call where I can learn about your business and what you want to promote. I create your series of 3 custom-written emails and load them into your email marketing system. If you don’t have an email marketing system, I’ll get one for you. We agree on a start date for the campaign, and hit the Send button. Only $27. You get all this for just $27!! Click now to get started. Schedule now. Pay later.